The two senators joined forces during a meeting originally to discuss amending to the wildly hated No Child Left Behind law, by rejecting standardized tests mandated by the George W. Bush-era law. Cruz and Paul aim at empowering students by keeping government out of the right for parents to have their students to opt-out of the mandatory testing and exams. In the past six months, students across the country have opted-out of intrusive PARCC exams (individual state devised Common Core curricula). School boards however have tried to fight back against the massive number of opt-outs by finding creative ways to either humiliate or harass students and their families. Long Island alone caught media attention when they saw some of the highest number of opt-outs in the country this past April. The bill provides states with increased flexibility and responsibility for developing accountability systems, deciding how federally required tests should be weighed, selecting additional measures of student and school performance, and implementing teacher evaluation systems. Opting out of standardized tests destroys the ability to get an accurate read on how students are performing in school and where achievement gaps between disadvantaged students and their peers lie. Amendments to the No Child Left Behind bill passed in the House of Representatives last week, which included the opt-out clause, yet the two Republicans and presidential rivals felt that though the House bill was a good model to continue off of, the Senate bill did not go far enough and was substantially weaker in protecting the educational rights of students and their parents. 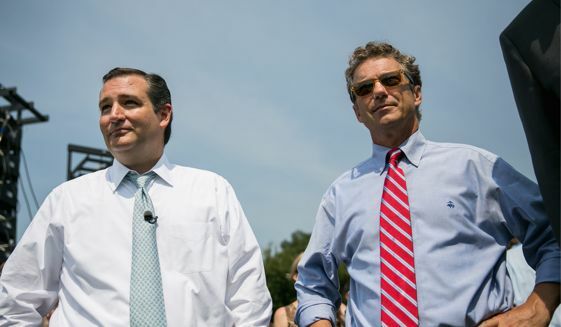 Popular conservatives Ted Cruz and Rand Paul have been a longtime advocates for a complete repeal of Common Core. Senator Rand Paul commented on the companion bill currently in the Senate chamber and how it “retains some of No Child Left Behind’s biggest flaws,” which "lack of adequate parental choice, a federal testing mandate and continued support for Common Core.” The flaws in the Senate's version of the bill were ultimately enough for 2016 contenders Senators Cruz, Paul, and even Marco Rubio to vote against it. Despite their vocal resistance to urge fellow Republicans to vote "nay", the bill ultimately passed in the Senate (the only 2016 GOP contender to vote for the bill was Sen. Lindsey Graham of South Carolina). While many teachers unions and other organizations against the opt-outs, even Obama appointed Education Secretary Arne Duncan has recently called for "states to evaluate how many tests students take and eliminate what they can." As of now Cruz and Paul are the only 2016 contenders to have a stable stance against Common Core, while other Republicans such as Scott Walker, Bobby Jindal, Chris Christie, and Jeb Bush have had a strange, off again-on again relationship with the education program which has upset so many Americans.